An imaginative, witty, original but deadly serious introduction to all the concepts you need in marketing today. Successful executives know that marketing as a process and an orientation is a necessity for understanding where a company needs to go and how to get there. It's not difficult to spot those organizations that have failed to adopt a marketing approach! In order for managers and students to quickly grasp the key principles, one of the world's leading marketing educators, Malcolm McDonald, has teamed up with expert cartoonist and educational designer, Peter Morris, to create this short, unique and powerful guide. 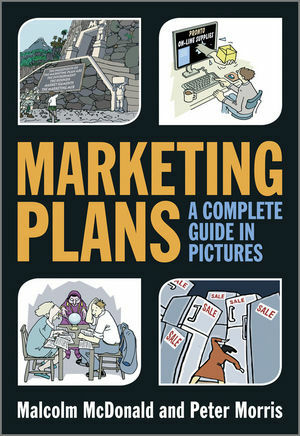 Using black and white cartoons and graphics packed with ideas and examples, Marketing Plans: A Complete Guide in Pictures is a highly accessible primer that is both a rigorous and serious introduction to the subject for those discovering marketing for the first time, and a versatile companion for more experienced professionals. This book is based on the international bestseller Marketing Plans: How to Prepare Them, How to Use Them by Malcolm McDonald and Hugh Wilson (Wiley). Malcolm McDonald was recently cited as one of the top marketing gurus in the world, along with Philip Kotler and Michael Porter and, in a 2006 Times HE piece, he was named as one of the top ten consultants in the UK. ?He is now Emeritus Professor at Cranfield University School of Management where, until recently, he was Professor of Marketing and Deputy Director. ?Formerly Marketing Director of Canada Dry, he is Chairman of six companies and works with many of the operating boards of the world's biggest multinationals on every continent. He is the author of over 40 books, many of which have been translated into several foreign languages and has published hundreds of articles and papers. Peter Morris NDD, ATD, illustrator and designer of educational and training material, head of design and manger of the Media Service Unit, University of Sussex. Co-founder and studio manage of Business Training, producer of corporate videos, co-author of Finance for Small Businesses, Total Quality Management, Selling Products and Services.